People displaced by natural disasters such as hurricane Irma could benefit from new, recyclable plastic-based shelters developed and tested by researchers at the University of Bath and plastics company Protomax. Building design experts from the University of Bath are working with Frome-based plastic engineering specialist, Protomax, to design and test the performance of reusable shelters which could provide much needed shelter and protection for people whose homes have been destroyed by natural disasters such as the hurricanes and flooding currently affecting large parts of the US and the Caribbean. 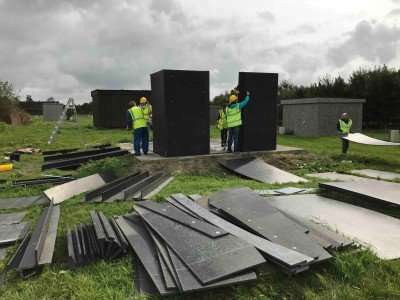 Storm Board emergency shelters are environmentally-friendly, made from recycled waste plastic which can easily be reprocessed and used again. They are somewhat similar to 'flat pack' furniture: easy to construct, cheap and come in a variety of colours. Each shelter measures 3.6 x 4.8 metres, providing a sufficient temporary space to shelter a family, or several could be linked together to form a larger structure. The Bath researchers are currently testing the performance of the shelters at the University's Building Research Park in Swindon, where the quality of the shelter they provide and their ability to survive winter weather is being tested. Waste plastic is having a significant negative effect on the environment and in oceans across the world. With more than eight million tons of plastic dumped into the oceans each year, one in three marine mammals have been found entangled in marine litter whilst over 90% of all sea birds have pieces of plastic in their stomachs. This approach to shelter design is playing a small part in reducing the negative environmental impact of the 300 million tons of plastic that is produced every year. The shelter's panels are made from a variety of waste plastics including those that pollute the oceans, and could even be produced on-board a ship as it removes waste plastic from the sea. They can be easily reprocessed and reused to make new shelters when needed, providing a beneficial use for this waste plastic. The US, Caribbean and parts of South America are currently experiencing the devastating effects of hurricanes Irma, Jose and Katia with at least 25 people having lost their lives, mass evacuations as well as widespread flooding and destruction of homes and buildings. People fleeing the hurricanes are having to take shelter wherever possible, from churches to public libraries to sports stadia. 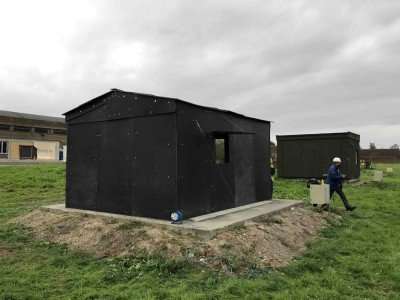 The shelters developed by Protomax and the University of Bath, which can be easily stored for decades then transported in flat pack form on pallets, could provide the millions of people affected with recyclable and easily deployable shelter solutions. Lead researcher and Professor of Low Carbon Design at the University of Bath, David Coley, said: "From the milk bottles to the ice-cream tubs we throw away each day, these waste plastics could provide a recyclable shelter solution to those people who have been left without a home. "The damage plastic causes our oceans and environment is clear to see and by using waste plastic to construct these shelters, we are not only helping put a roof over people's heads but also playing our own part in reducing the impact of waste plastic." Nico Stillwell from Protomax added: "A shelter built from Storm Board marks a step up in shelter design, from tent to an interim home. The weather proof boards provide a level of insulation and security that a tent simply cannot achieve. "Storm Board has the dual purpose of cleaning up the environment and providing jobs and shelter where it is needed. The concept of a mobile 'factory in a container' to produce Storm Board where it is needed, for example within a refugee camp, using local resources and manpower is also being developed and tested in conjunction with the University of Bath." This project is part of a wider EPSRC-funded international research project in which the Bath research team is designing and testing low cost and easy to construct shelters made from sustainable materials for refugees living in extreme climates.